Often simple desserts are better than complicated ones. That is not to say that the flavors are simple. What I mean is that the dessert itself is made of only a few very well constructed components. 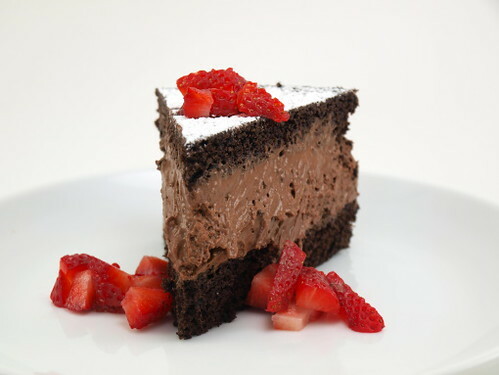 This mousse cake is an example of this. 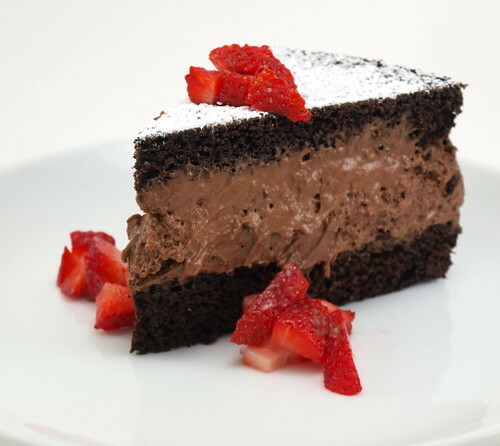 Tender cake fluffy, rich mousse, and a light dusting of powdered sugar are all you need to create something very impressive. Well, maybe a few well placed berries would not go amiss. 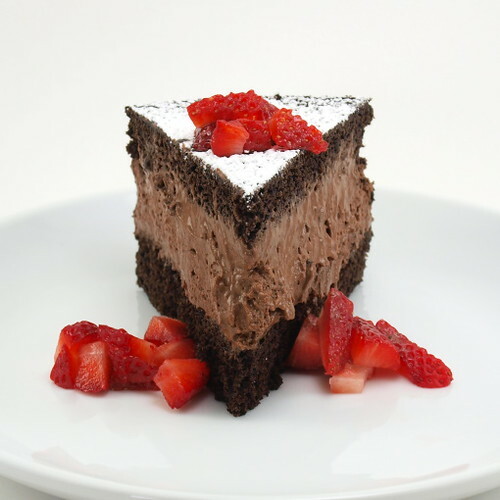 The mousse should be made first so it can completely set up while the cake bakes and cools. 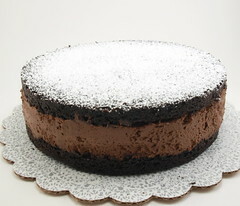 You could frost this cake if you wanted, or pour some warm ganache over the top but it does not need it. 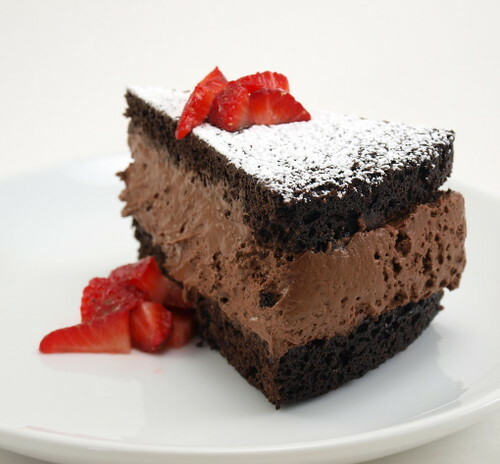 The mousse is rich enough, and the cake is moist enough, that frosting or ganache might actually take away from the delicate flavors. You can make this a day in advance, just let it sit at room temperature for thirty minutes before cutting. 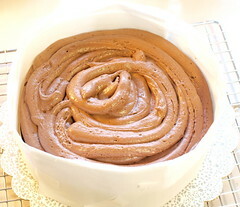 Begin by preparing the mousse. 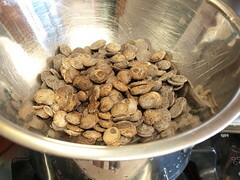 In a double boiler melt the chocolate with the water until smooth. Set aside to cool slightly. 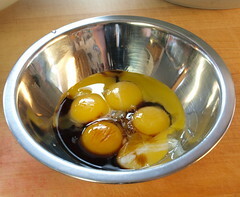 In a small bowl combine the egg yolks with the liqueur and vanilla. Pour this into the chocolate mixture and whisk to combine. 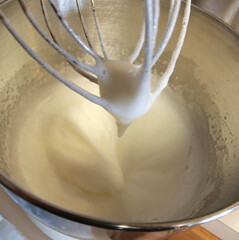 In the bowl of a stand mixer with the whip attachment, whip the egg whites with the cream of tartar and salt until they begin to foam. Gradually add the sugar and whip until they form medium peaks. Move to a clean bowl and set aside. In the same bowl you whipped the egg whites in add the cream and whip until the cream holds medium peaks. 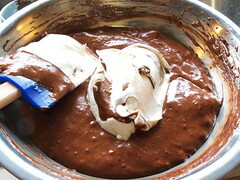 Add 1/3 of the egg whites into the chocolate mixture and fold in to lighten. Continue adding egg whites, 1/3 at a time, until they are completely folded in. 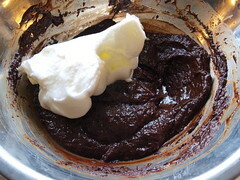 Add the whipped cream in two additions and fold into the chocolate mixture. Cover the mixture and chill for at least two hours. While the mixture chills prepare the cake. Heat the oven to 350 F and spray an 8″ pan with non-stick cooking spray. 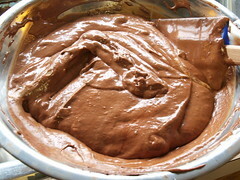 In a medium bowl whisk the flour, cocoa powder, baking soda, baking powder, sugar, and salt until well mixed. In a separate bowl whisk together the butter, eggs, buttermilk, vanilla, and water. Pour the wet into the dry and whisk until smooth. 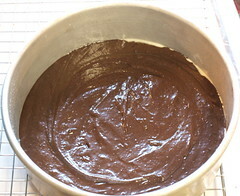 Pour the batter into the prepared pan and bake for 30 to 35 minutes, or until the cake pulls away from the sides of the pan and the center springs back when lightly pressed. Cool ten minutes in the pan before turning out on a wire rack to cool completely. To assemble the cake begin by cutting the cake in half. Place one half of the cake, cut side up, on a cake board or plate. 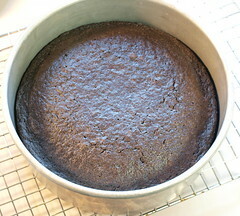 Use parchment paper, or wax paper, to form a ring around the cake. Secure with tape. Pipe the chilled mousse into the cake, making sure to pipe it in an even layer. 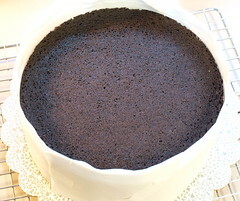 Top with the second half of the cake cut side down. 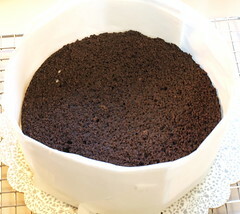 Chill the cake for two hours before removing the parchment paper ring. Allow to sit at room temperature for thirty minutes before cutting. Dust with powdered sugar, if desired. *Please note, this recipe contains raw or undercooked eggs and should not be eaten by those with health problems, young children, pregnant women, or the infirm.